Popularly know as ‘Dal Fry’ Dal or lentils, peas and beans are cooked practically daily in almost every Indian home, vegetarian or not. Each region has its own favorites and cooking methods. Some are cooked with garlic and ginger, in addition to the staple spices of turmeric, cumin and coriander. Dal can range from spicy-sweet to scorching hot, soup like or dry like a pilaf. In a large saucepan add 3 cups of water and bring it to a boil. Then add lentils, ginger, serrano pepper, onion, turmeric, and tomato. Stir well and bring it to a good boil. As soon as it comes to a boil, cover the saucepan with a lid (leaving a little open for the steam to let out), lower the heat and simmer lentils for at least 30 minutes. (It may take anything between 30 – 45 minutes for the lentils to cook thoroughly). You might need to stir occasionally and make sure there is enough water in the pan if not add more water (½ cup of hot water at a time). Add salt and stir well. In small pan heat oil over medium heat, add garlic and cumin seeds. Once garlic turns light brown add red chili powder or cayenne pepper. 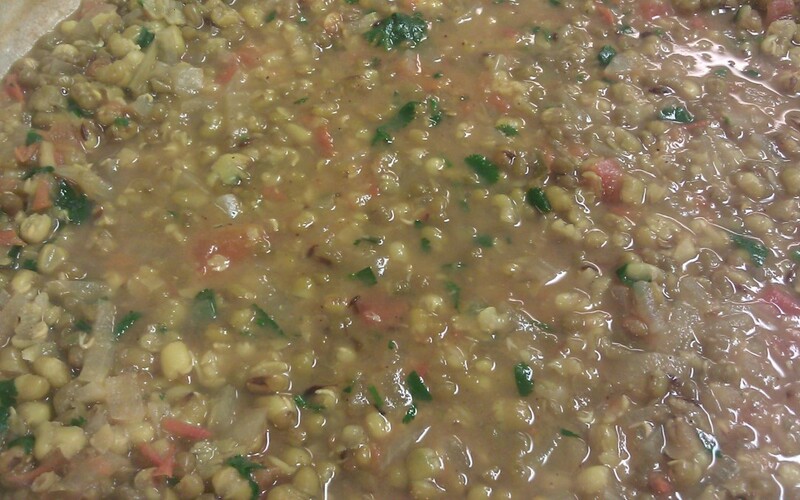 Cook for a few seconds and pour this tempering over the lentils, mix well. Garnish with cilantro.